With the holidays come the holiday parties! What to bring to can be almost as stressful as the holiday themselves. However, withthe wide variety of holiday gifts to choose from, one of these holiday gifts for the home is certain to please. 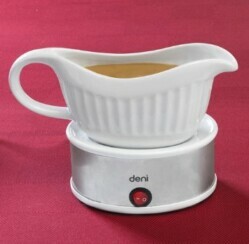 One gift idea that will certainly be used is the electric gravy warmer. Unconventional, this gift idea is sure to put a smile on the face of that holiday chef. Varying in size and shape as well as heat source (also comes with the option of a tea light candle) this wise kitchen accessory can also be used for sauces as in eggs Benedict or Hollandaise sauce as well as bordelaise, cheese sauces. You can also use this for melted butter, dressings, dips and ice cream toppings! 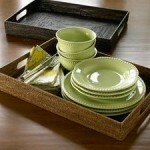 This gift truly is simplicity at its best, convenient and easy to use. to withstand up to forty pounds of weight the trays can be used for passing the turkey or ham around the holiday dinner table, or for serving breakfast in bed to your loved ones. 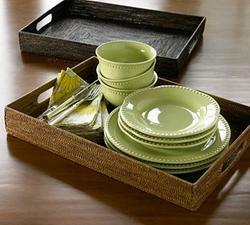 Another use for these serving trays would be atop a luggage rack for serving cocktails, atop an upholstered ottoman for serving drinks or appetizers, or even in drawers or cabinets to separate storage items. One memorable, not-to-be-outdone holiday gift is the amazing personalized photo lamp. This unique gift allows you to take a memorable photo and within a few clicks and a couple of weeks, you have a very special personalized carved table top lamp. Measuring 8” x 10” in size the frame comes in a variety of choices and has an electric cord with an on/off switch. This special holiday gift is designed to capture those special moments forever throughout the entire year. For the steak-lover on your list, a must have item is very special steak knife set complete with wood case. This is a gift that will certainly get used with a sense of pride as well as attitude. Don’t forget the aspiring chef of your holiday list! Items that make great gifts are kitchen utensil sets, hand-crafted aprons as well as a towel set. Cookbooks are always a good standby holiday gift and are welcomed by those who aspire to be creative in the kitchen. As the home is where the heart is, make sure you select the perfect gift sure to warm the home of any heart on your holiday list.